Digital Hajj: How religion feels using Mecca 3D, Second Life, virtual worlds, and online. Preparing for it online might have helped some. 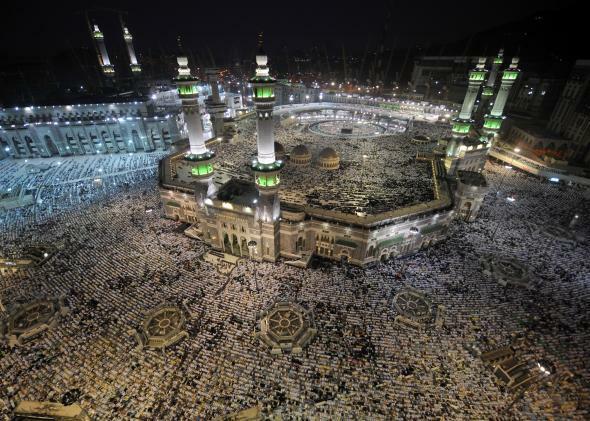 Some 2 million Muslims undertook this year’s hajj, a journey to the Holy Mosque at Mecca that takes place in the last month of the Islamic calendar. The pilgrimage officially ended Monday. It is one of the Five Pillars of Islam that any Muslim capable of it must make this trek at least once. Thanks to modern innovations, many more now can: Back in the 1950s, about 100,000 pilgrims performed it each year. Technology is changing how the faithful engage with the tradition, too. Preparing for hajj used to just be a course full of texts and lectures, but now YouTube videos and online forums make lessons livelier. The prototype for a new app, Mecca 3D, was released this summer, and lets users explore a true-to-scale digital rendition of the Mosque at Mecca. It has been downloaded about 80,000 times on Android and iOS, according to its creator, Bilal Chbib. * He hopes to add interactive lessons and to integrate the program with Oculus Rift, a virtual reality simulator. Going on a technologically mediated pilgrimage might resemble the experience of a flight simulator. “You can never substitute the place where the Prophet stood,” as Chbib says. But virtual participation in religious activities can still give people an authentic experience, though of a different sort. Krystina Derrickson, an Islamic scholar, writes of visiting Mecca in the virtual world program Second Life: “When my ‘avatar’ visits the Mosque, I feel compelled to take off my avatar’s shoes,” she says, “because, really, it’s me visiting that Mosque.” The Mosque is not real, but that does not mean it lacks “a rather noticeable social and cultural reality.” Derrickson thinks that this gives it and other digital religious spaces a kind of “ambiguous” sacredness. Devotion facilitated by technology is not new. Webcams have been recording activities near the Western Wall for more than a decade; Buddhist temples take emails requesting monks for prayer. Second Life houses synagogues and churches as well as mosques, where avatars can gather to pray. OnIslam, a popular forum based in Cairo, used to run a hajj education program in Second Life, where participants could learn the rituals they would need to perform in Mecca in the virtual Mosque that Derrickson describes. The training course attracted about 400 visitors a year when it operated. Other versions of digital religious life range from prayer forums to apps for performing confession. Scholars of all faiths are divided on how to sanction the role of all this technology in religion. (Hajj pilgrims who took selfies this year, for example, caused some grumbling.) Deciding how virtual religious experiences should be viewed is even trickier. Conservatives find technological tools piety by proxy and frown upon them. Progressives think they have legitimacy. Whether the actual virtual experience will affect a user depends on how she and the community around her choose to interpret it, says Heidi Campbell, who teaches religion and media at Texas A&M University. In Second Life, most religious spaces will have introductory cards to outline the values of that community and set the tone for behavior. Groups tend to bring in the boundaries they set in life into virtual worlds, says Campbell, so those who view technologically mediated religious acts as legitimate will treat them as such, while those who don’t will not imbue a forum or a digital place with the corresponding respect. “I’ve been to some [houses of worship] in Second Life with avatars flying around during services, and others where things are somber,” she says. The atmosphere around Mecca in Second Life is reverential, she notes, and when she has used it to teach students about hajj, those who have done the pilgrimage report a feeling of reconnecting with the real event. No worshipper would equate a virtual spiritual act with one done in the flesh. “There are two different notions of what ‘sacredness’ means,” observes Tom Boellstorff, a digital media and Islam scholar at University of California, Irvine. Something can be sacred because it has been touched or created by the divine. Or, sacredness can come from feeling a connection that brings a worshipper closer to divinity, such as the recitation of a liturgy. Digital religious practice could give a sense of the latter to some, but not the former. But even without bringing about any spiritual stirring, virtual religious programs can be appealing, practical tools. Ishtiaq Hossain, one of my Slate colleagues, is a practicing Muslim in Washington, who has not undertaken hajj, but hopes to. He would use a virtual tour program like Mecca 3D, he thinks, to supplement the stories he’s heard and texts he’s read about its rites and meaning. Hajj requires intent and knowledge—perhaps an immersive virtual experience will increasingly become part of the journey. Correction, October 8, 2014: This post originally misstated the number of times Mecca 3D has been downloaded. It is about 80,000 on Android and iOS combined, not Android alone.